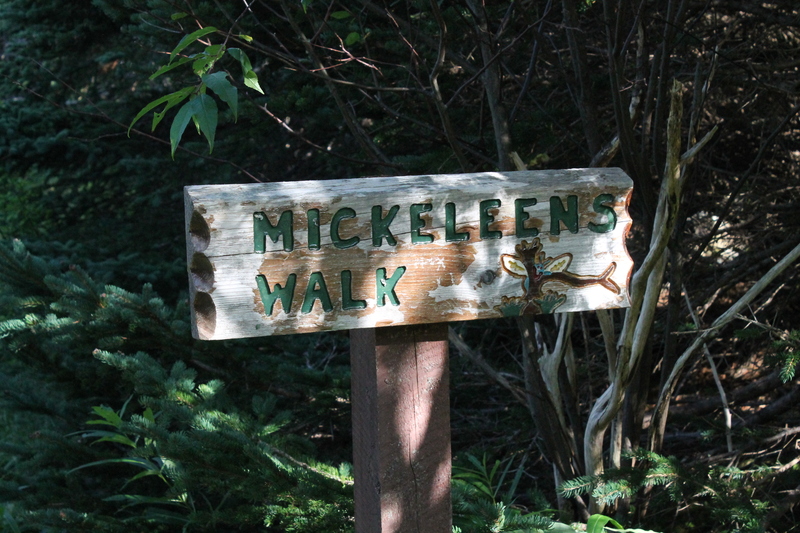 Mickeleen’s Path is a relatively easy 7.3 km hike, with the option to walk it as a loop, taking the Old Track, an older, unmaintained road connecting Witless Bay and Bay Bulls, for a total of 10.6 km. 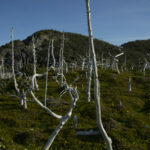 The 7.3 km of the ECT is well-maintained and easy to hike, but hikers should be aware that the Old Track, while wide and even, has many large wet patches that are difficult to avoid, and which will slow you down. The trail begins after a short walk from the turnaround at the end of Quay’s Road. 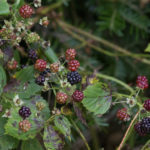 Turning left towards the shore, the trail crosses planks through massive patches of raspberries, which, when we walked through, were ripe enough to fall off the bushes and were too tempting for Heather. 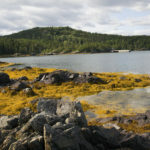 For a couple of kilometers the trail passes through woods with rocky shores and cliffs on the left, until it passes above Island Cove, the site of a nice view as the trail passes through a meadow at the top of the cove. 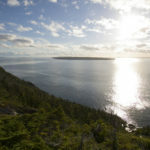 From there, the trail skirts around Big Cove and Chest Cove, where a waterfall is visible from the viewpoint overlooking it. 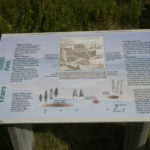 The next viewpoint is at Baboul Rocks, after which the trail passes over meadowland to Southern Head. Passing Southern Head with a view of the Fiddler, a deep gulch, the red rocks of Lower Red Cove are visible looking back. 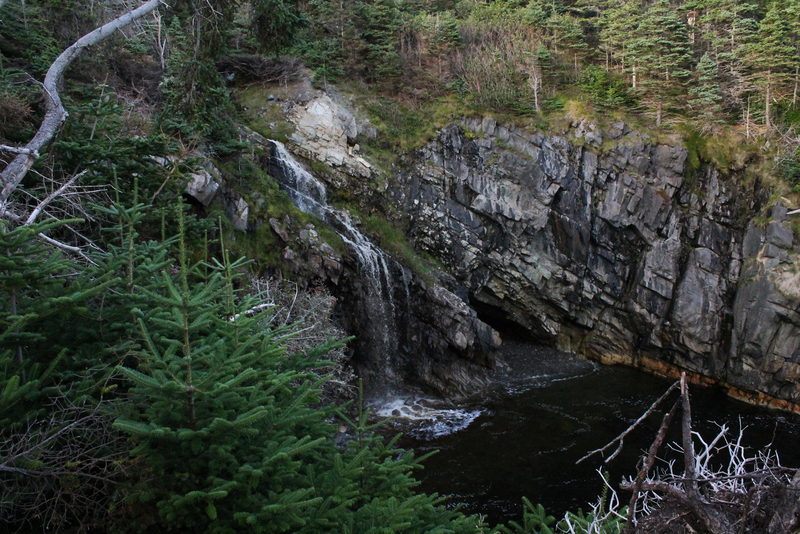 Passing the sharp rocks of Mutton Cove, a side trail leads to a spectacular waterfall at Otter Cove. 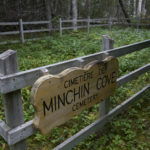 After passing through woods and over rivers, the trail comes to a cliff edge where a memorial to William Tobin Jr. is found, who, according to the ECT website, drowned when trying to rescue his dog from one of the gulches. 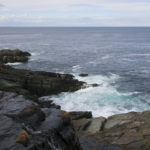 Beyond this point it is a short walk to Horses Back, where cobblestones roar as the waves pass over them, and around Bears Cove, as the trail reaches the edge of Witless Bay. From there it’s a short jaunt through grassy fields and trees to the trailhead. The path to the Old Track can be found 50 or 100 m down the road on the opposite side, passing new construction on the left and behind established properties on the right, before turning right toward Bay Bulls. 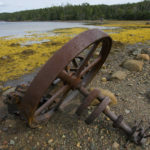 At the end of the Old Track, turn off at the meadow and rock pile just before you see houses, otherwise, you’ve gone too far and will be forced to backtrack along roads in Bay Bulls. 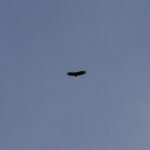 Click on pictures in the gallery below to zoom in and examine them in more detail! The trail begins 280 m from the turnaround. The trailhead in over the path. The boardwalk is particularly well done on this trail. The trail passes a meadow at the top of Island Cove. Another view of Island Cove from above. The trail passes a few babbling brooks via rock bridge. A waterfall at Chest Cove. The lookout at Chest Cove Point. 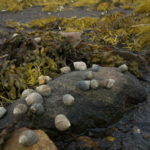 The Baboul (the root of the name Bay Bulls?) Rocks lookout. Baboul Rocks are apparently spectacular when the sea is choppy. The meadow on the approach to Southern Head. South Head, or Southern Head according to the map. Continuing past Southern Head, the islands of the Witless Bay Ecological Preserve are visible in the distance. The Fiddler, a deep gulch past Southern Head. 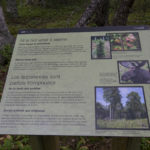 The trail marker indicating Mutton Cove. The beautiful falls at Otter Cove. 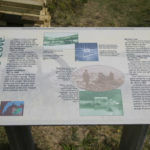 The marker for the side trail at Otter Cove. The trail passes over a brook and over rocks. The site of the memorial for William Tobin, Jr., only 16 years old. A beautiful memorial for a very sad event. The first signs of private property are usually old stone property lines. 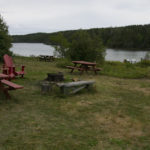 Houses at Bears Cove have a spectacular view of Witless Bay. Heather always manages to attract a local greeter! Heading back along the old track, essentially a cart/ATV path at this point. The wet Old Track offered a few obstacles. A rock pile at the access trail back to the trailhead at the end of Quay’s Road. Great pictures. I was just wondering how far back along the old track is the car wreck? Thanks Jim! 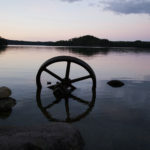 If memory serves, that car wreck is not more than a kilometer or so beyond the Witless Bay side trail to the old track. 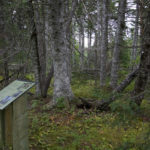 The access point in Witless Bay is a little tough to spot; maybe 50 m from the Mickeleen’s Path trailhead on the opposite side of the road. The path skirts the back of some private properties before making a left turn north into the woods. It joins the Old Track which runs west to east… you’d be heading east, and I don’t think you’d have to head too far before you encounter the wreck. It’s been a while since that picture was taken, though, so my mental GPS might be slightly off!